New York—The Communist Party is using its influence over judges within China’s court system to send an unprecedented number of innocent Chinese to prison camps because of their religious belief, the Falun Dafa Information Center reported on Monday. The Center released a list of 863 Falun Gong practitioners recently given prison terms of up to 18 years following sham trials (list). Cases were identified in 29 out of China’s 31 provinces and municipalities, including Beijing, Shanghai, and Xinjiang. The intensified manipulation of judges appears to be partly in response to international criticism of the Party’s reliance on extrajudicial “brainwashing” centers and “re-education through labor” (RTL) camps to detain Falun Gong practitioners. It is also serving as a means for the Party to incarcerate practitioners for longer periods at a time compared to RTL camps. “The Party seems to be putting more energy into its ‘rule of law’ veneer surrounding the anti-Falun Gong campaign, while still enabling widespread and illegal incarceration of practitioners,” says Falun Dafa Information Center spokesman Erping Zhang. “The bottom line remains, however, that these people should never have been picked up by the police in the first place. Their only ‘crime’ is to peacefully practice their faith and tell others about the persecution they face, both of which are entirely legal under Chinese law,”. Since the Communist Party launched its campaign to wipe out Falun Gong in 1999, it has relied extensively on “brainwashing” centers and RTL camps to detain hundreds of thousands of innocent practitioners, violating their rights under Chinese and international law. Practitioners are typically sent to the camps without formal charges or trial for up to three years. A smaller number of adherents have been sent to prison camps for longer periods following sham trials. Once incarcerated in either type of facility, practitioners are subject to frequent torture, hard labor in hazardous conditions, and other measures to forcibly “transform” them and induce them to renounce their religious convictions. Following the end of the Beijing Olympics and ongoing criticism from the United Nations and foreign governments of the Chinese authorities’ use of extrajudicial means to detain practitioners, the Center has observed a sharp increase in the number of judges “sentencing” practitioners to prison camps under orders from Party officials. In place of one to three years detention in an RTL camp, practitioners now face illegal incarceration for much longer—routinely exceeding eight years. Article 300 is the penal code provision most often used by the Party to justify imprisonment of Falun Gong practitioners. According to international experts and prominent Chinese lawyers, however, Article 300 does not meet minimum international legal standards of clarity and specificity. In light of ongoing reports of torture at prison facilities, the mass sentencing has further heightened the dangers facing adherents in China, raising concerns over how many of those imprisoned might live to complete their terms. The Falun Dafa Information Center is releasing today a preliminary list of 863 Falun Gong practitioners who have been “sentenced” to prison camps over the past year and a half (list). The list was compiled based on reports received between January and June 2009 from a network of informants inside and outside China. Each entry contains details such as the name of the practitioner, city and province, date of arrest, date of sentencing, lawyer’s name where available, and other relevant information. At least 574 (66 percent) of the individuals documented in the list were detained in the run-up to the Beijing Olympics as the Communist Party used the Games to justify escalating its campaign against Falun Gong. This reinforces the assessment that many ordinary Chinese continue to suffer as a result of the pre-Olympic crackdown long after the international spotlight has faded. The Center continues to receive reports on a weekly basis of adherents being sent to RTL and prison camps. Due to the large volume, the Center is in the process of documenting and verifying hundreds of these additional cases received since June for publication in early 2010. 1. Over 60 percent “sentenced” to at least four years: 525 out of 863 practitioners were “sentenced” to at least 4 years, while 63 were “sentenced” to at least 10. By contrast, 260 were “sentenced” to three years or less. Such patterns represent a significant escalation compared to recent years. 2. Victims of All Ages and Professions: The victims listed range from a 20-year-old woman abducted from her Liaoning home in August 2008 (later “sentenced” to 4 years) to an 80-year-old man from Sichuan put on “trial” in May 2009 (“sentenced” to 3 years). The occupations of the victims include farmers, retired factory workers, bureaucrats, entrepreneurs, and doctors. Of particular note is the large number of individuals (53) involved in the educational sector who are among those illegally imprisoned, including teachers, university lecturers, graduate students, researchers at technical institutes, and professors emeritus. 3. Many Victims Abducted from Home or Workplace: At least 144 of the victims are known to have been abducted from their home by security agents; at least 44 were taken from their workplace or while en route to work. As full details are not available for all cases, the actual number is likely much higher. This pattern highlights the extent to which Falun Gong practitioners in China remain at risk of imprisonment by mere virtue of their identity as adherents being known to the authorities. 4. Many Victims Previously Tortured, Imprisoned: A large number of the victims had previously been illegally detained in RTL or prison camps for practicing Falun Gong, sometimes twice. Most had been tortured in custody—including being beaten, deprived of sleep, and shocked with electric batons. This pattern reinforces the assessment that the long sentences target those found by the authorities to have resumed practicing even after release from previous—and almost always shorter—periods in detention. It also highlights the severe risk of torture facing them at present. 5. Routine Disregard for Due Process: As an indication of the prearranged and ultimately illegal nature of the practitioners’ imprisonment, a range of basic rights, including those guaranteed under Chinese law, were routinely violated: most “trials” lasted only a few minutes or hours; a large percentage of “trials” were held in secret without the victim’s family or lawyer being informed; detainees were subjected to pretrial detention of as much as 18 months, during which time many were tortured; all verdicts that were appealed to higher courts were upheld, sometimes without even a hearing. In addition, 136 of the practitioners in the list were represented by human rights attorneys, including many of China’s most prominent ones such as Li Heping, Tang Jitian, and the above-mentioned Jiang Tianyong. These lawyers often presented a strong and legally sound defense of adherents’ in court. The Party’s response has been to instruct judges to disregard the lawyers’ legal arguments, while ordering security forces and the lawyers’ association to punish the lawyers and block them from representing their clients. The measures taken have included obstructing lawyers from meeting their detained clients in contravention of China’s 2007 Law on Lawyers; physically preventing lawyers from representing practitioners in court; assaulting and beating attorneys visiting their client’s families; refusing to renew over 20 lawyers’ licenses to practice law. At least one lawyer, Wang Yonghang, has himself been “sentenced” to seven years in a prison camp for defending practitioners and challenging the legality of judges using Article 300 to imprison them. Prof. Zhang, 67, is a retired Physics instructor from a university in Shandong’s Jinan city. He was abducted by security agents from home with his wife on July 16, 2008 and subsequently “sentenced” to seven years in a prison camp following a sham trial on March 31, 2009. The hearing, held in Shandong province’s Shizhong District Court and presided over by judge Wang Limin, lasted just hours. Police blocked his lawyer Mr. Li Subin from attending. Both Li and Zhang’s other lawyer, Ms. Liu Wei, have since had the renewal of their license to practice law denied. Prof. Zhang had previously been held and tortured at an RTL camp for three years between 2001 and 2004. Prof. Zhang’s daughter, Zhang Shuangying, currently resides in New York City and is available for interview. His case has been reported in the New York Times (news), New York Daily News (news), Voice of America (news) and by the U.S. State Department (report). Copies of official Chinese documents related to his detention and sentencing are available upon request. Ms. Chen, in her forties, is a former English teacher from Wuhan in Hubei province. She was abducted by security agents from her workplace on February 11, 2008 and subsequently “sentenced” in secret in April 2009 to a prison camp for seven years. The hearing was held in Hongshan District Court and presided over by Ms. Xu Zhongquan. On the same occasion, restaurant owner Mr. Zhou Xiaojun was “sentenced” to six years and Ms. Hu Huifang, also a teacher, was “sentenced” to four years. 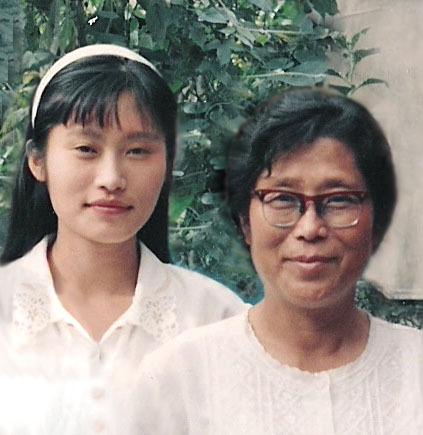 Ms. Chen’s husband, Mr. Zhang Weijie, was detained in 2007 and sent for one year of “re-education through labor.” Following the end of his term in December 2008, he was immediately taken to a “brainwashing” class. Ms. Chen’s daughter, Sunny Xu, is currently studying in Finland and is available for interview. For a first person account by Mr. Zhang of the persecution he and his wife had suffered as of August 2007 (full story). Ms. Liu, in her forties, is a former employee at a textile factory in Jizhou city, Liaoning province. She was abducted from her workplace by security agents on February 25, 2008 and “sentenced” for 13 years on August 27, 2008. The hearing was held at Taihe District Court and presided over by judge Liang Hexiang. Prior to the hearing, she was reportedly hooded and severely tortured. She attempted to appeal the decision, but the original sentence was upheld with no additional hearing. Ms. Liu’s case was handled by prominent Beijing attorneys Li Heping and Jiang Tianyong. A copy of Li’s defense in court, including reports of her abuse in custody and assertion of the illegality of the campaign against Falun Gong, is available here (in Chinese: report). His family subsequently hired Beijing lawyers Li Heping, Wang Yajun, Cao Ming, and Guo Shaofei to represent him during his appeal. However, Songyuan Intermediate Court repeatedly changed the date of the hearing and eventually upheld the original sentence without holding a trial, apparently as a means of depriving the attorneys an opportunity to defend their client. Mr. Song was transferred on May 14, 2009 to Jilin prison, where he is currently being held and at severe risk of torture. Ms. Yang, 68, is a retired English teacher, who previously taught at Middle Schools No. 5, 38, and 105 in Shenyang, Liaoning province and has practiced Falun Gong since 1996. Ms. Li graduated from the Foreign Languages Department of Shenyang University and previously worked as a former operational manager for McDonald’s covering Northeast China; she took up Falun Gong in 2004. The two women were abducted from their home by security agents on June 24, 2009. Both were subsequently “sentenced” to a prison camp for three years on May 21, 2009 at Heping court in a joint hearing presided over by judge Yao Hong. Their cases were handled by attorneys Han Zhiguang and Wang Yajun from Beijing, as well as Sun Wenbing from Shenyang. Their 70-year-old husband/father remains at home with no one to care for him.